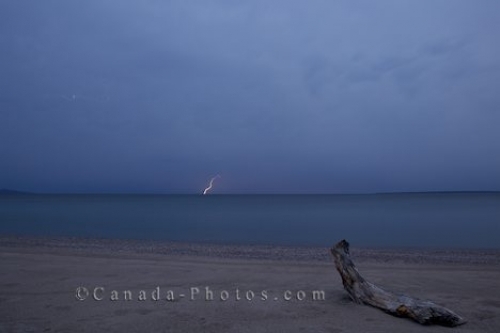 From the Agawa Bay Campground situated along the shoreline of Lake Superior in Ontario, Canada, storm watching can be a exciting way to spend the evening. As a lightning bolt brightens the sky, the clouds begin to thicken as the rain starts to build and will eventually begin to dampen the area. Thunder and lightning storm approaching Agawa Bay Campground on the shores of Lake Superior in Lake Superior Provincial Park, Ontario, Canada. Picture of a lightning flash during a storm over Lake Superior in Lake Superior Provincial Park in Ontario, Canada.